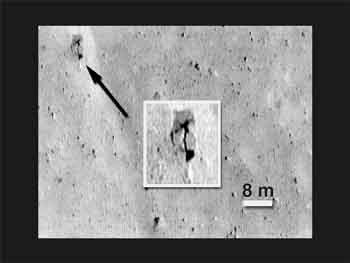 LAUREL, MARYLAND--Researchers here are puzzling over the last pictures returned by the NEAR Shoemaker spacecraft as it descended to its final resting place on the surface of asteroid Eros. At a press conference here last week at Johns Hopkins University's Applied Research Laboratory, team members showed pictures that reveal that something--no one knows quite what--is shaping the surface of Eros into bizarre "ponds" with "beaches" marked by "footprints." Something else is populating the surface with boulders. "Our jaws are just hanging out," says NEAR imaging team member Clark Chapman of Southwest Research Institute in Boulder, Colorado. 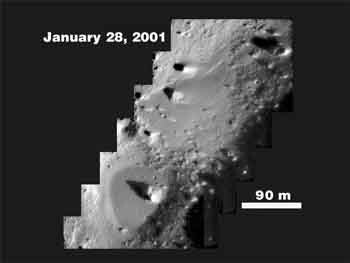 Never designed to land, NEAR Shoemaker made "perhaps the softest [planetary] landing ever" on 12 February in what was expected to be a mission-ending descent to the surface of the 33-kilometer-long asteroid. To the surprise of everyone, the spacecraft continued to beam a radio beacon back to Earth after touchdown. Telemetry was still being received 2 days later, prompting NASA to extend the mission for up to 10 days. With the barrel-shaped, half-ton spacecraft apparently propped on two solar panels, the gamma ray spectrometer was fired back up in hopes of refining the surface-composition measurements made from Eros orbit, according to spectrometer team leader Jacob Trombka of NASA's Goddard Space Flight Center in Greenbelt, Maryland. NEAR Shoemaker's picture-taking days are over, because its telephoto lens is nearly in the dirt. 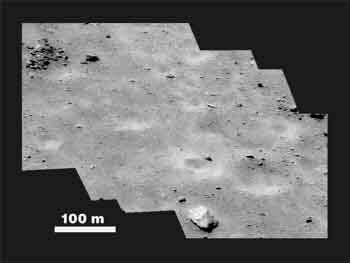 But the last images it sent back should keep planetary geologists busy for years. "I never would have imagined you'd see some of these things on an asteroid," says Chapman. The mysteries start with an abundance of huge boulders--perhaps a million of them larger than 8 meters--visible on the surface. One explanation being considered by planetary dynamicist Erik Asphaug of the University of California, Santa Cruz, and his colleagues is seismic shaking: Large impacts might so shake Eros that the surface debris would settle like mixed nuts in a can, with the big, heavy bits rising to the top and the smaller ones falling to the bottom. This "Brazil-nut effect" might have caused boulders completely buried in the surface debris to rise into view, they say. Another mechanism probably accounts for how the very finest material not only separated out but found its way to low spots, notes imaging team leader Joseph Veverka of Cornell University. Somehow, the finer looking material has filled in low spots to form flat deposits resembling ponds. A transition zone from smooth pond to rougher surroundings resembles a beach, notes Chapman. And in the last image returned by NEAR Shoemaker from an altitude of 125 meters, some spots the size of a footprint--though irregular in shape--seem to have collapsed a few centimeters, as if the fine material was somehow compressed. One way fine material might move around would be for sunlight to charge it up electrostatically, notes Veverka. That could levitate dust and allow it to move downhill, as happens on the moon to an inconsequential extent and as has been suggested for Jupiter's moon Callisto. But nobody's betting on the accuracy of any of these theories. "We're facing processes we're not familiar with," says Veverka. "I truly don't know what's going on."